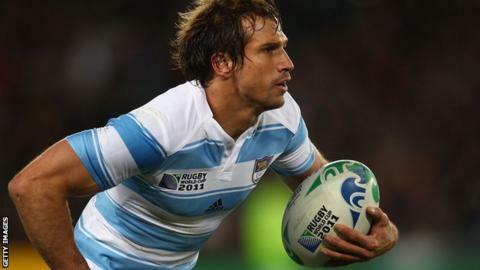 Wing Gonzalo Camacho will return to Leicester Tigers this week, with the club hopeful he can prove his fitness. The 30-year-old has never played for Tigers following his arrival two years ago, having picked up a shoulder injury playing for Argentina in 2013. Director of rugby Richard Cockerill told BBC Radio Leicester: "We want to make sure he has a contract here. "We have come this far with him and has started to play again. It would be nice to see him play in a Tigers shirt." Camacho has had three surgeries on his shoulder but returned to competitive rugby for Argentina against New Zealand last month. His contract was due to run out this summer but Cockerill does not want to lose the former Exeter and Harlequins player. "It has been a really tough time for him. He is a really good guy and he's been really hard working," said Cockerill. "We want to see if we can make it work and I am pretty sure we can. "He will be back this week, he will train with us and I look forward to getting him in a Tigers shirt."